Shipping weight = 1.12 lbs. 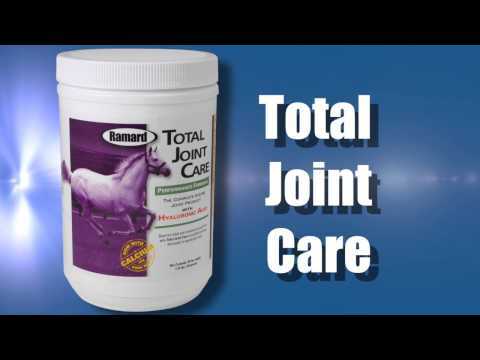 Developed by a team of veterinarians, trainers, and biochemists, Ramard™ Total Joint Care is a highly beneficial, synergistic blend of powerful joint care products that focus on entire joint, not just pieces. Cartilage, soft tissue, tendons and ligaments, and synovial fluid all need to be healthy to achieve peak performance. The Hyaluronic Acid in Total Joint Care, combined with Glucosamine, Chondroitin, and MSM, combine to provide support to the entire equine joint. Feed 1 scoop (0.6 oz.) per day or as directed by your veterinarian. May increase to 2 scoops per day for extenuating circumstance. Horse seems much improved. Had not been able to hold hind up for farrier previously. Farrier seeing improvement in hind leg to work on. Using the Canine Version for St Bernard. Had chronic limp. On two tabs/day for 30+ days no longer limping. Someone recommended this product and I have put my mare on it. She seems more sound but it being winter and her not being in work it is hard to tell - but I will keep her on it and keep my fingers crossed for a good spring. Unfortunately it does take a little work to get her to eat it. This was the best price I found online. Saw great results within 30 days after switching from a product that we had used for years. Great product for senior horses. I have a 26 yr old QH who has Lyme. Her joints are swollen, and prior to using this product, she had stiffness and pain, to the point I was considering putting her down. My mare has been on Remard Total Joint Care for almost 2years now, and her movement and comfort has increased to the point where she can freely canter in the field, is very feisty and even bucks playfully with her pasturemate. The 200mg of HA is more than most products offer, as well as the other important ingredients. It's a great product, and has given my old mare another lease on life! Thank you! whenever I look to add anything to my horses diet I really do search for the best product for the particular need.Sometimes this takes days of searching and even phone calls to product companies and even vets. That being said, my 5yr old paint mare was recently diagnosed with high ringbone and so began my search! When I found Ramard Total Joint Care I felt like I found the right product. It is one of the highest combo joint care I could find. Very high in HA, Glucosomine, Chondroiten, MSM, Vit C ,a little zinc etc. I also bought Iconoclast support boots, the shoer is rolling her toe, and so far so good. the trainer rode her gathering cattle for 8 hours, without boots and not a lame step! Not sore the next day either. Just re ordered the product but it is on back order, so patiently waiting. I am convinced this is a great product. Also no problem getting her to eat it! Helps my stiff old pony move a little better. Still getting ridden at 24. Has been on this for years after trying many different supplements that did not do much. Past experience. Helps older horses. simply, the best joint care there is! Recommended by a horse trainer named James Dimmett. Works very well on my mare and gelding. There coats also shine from flax in the ingredients. This product is a great joint product, noticeable improvement after 30 days. Took my horse off to see if there was a difference and yes so put her back on it. This also is the best price I have found. Have a Mini gelding with rear left stifle issues. Any luck with this product? BEST ANSWER: My horse usually has to get his hocks injected once a year and is stiff behind. I saw an improvement in his movement behind after a couple of weeks and it has been over a year since he has had his hocks injected. i would recommend this product. I have a Morgan horse that has rwar hind issues. I had used a well-know competitive product and found that this product works better. Hope that helps. my mare did not have stifle issues, but this is a great company and great formula and I would try it for any joint problem! As far as joint supplements go, this us a very good one. Will this help my older mare with OCD? BEST ANSWER: Hi, I am certainly not a vet but I can tell you my mare with high ringbone will never be without this product, I would recommend you contact Ramard directly and if possible speak with Jeff Ramey, the owner and a horse man as well. The website has great information. Good luck! !